Store lamb sales are held on Friday at 10:30am. 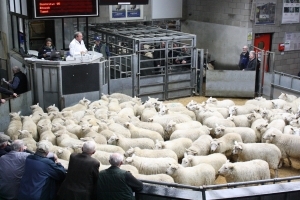 In these autumn months, it is not uncommon for more than 8,000 lambs to be consigned giving buyers an unparalleled chance to make up lorry loads of their ideal specification. Many of the lambs come from the further out regions of ANM’s trading area with consignments shipped weekly from Orkney and Shetland using high welfare roll-on, roll-off livestock containers. This, coupled with the extensive indoor and field lairage at Thainstone, means that lambs arrive in the ring rested and looking their best. There are draws too from across the mainland including Highland Perthshire. 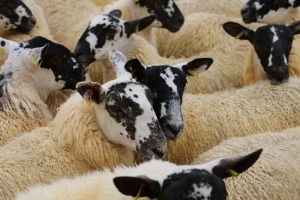 Buyers are equally spread out geographically with some lambs going to new homes in the north-east and others heading as far south as the borders and beyond for finishing. Cull ewes are also sold on a weekly basis on a Thursday afternoon with buyers from the north of England and the Midlands finding it worthwhile to source from Thainstone on a regular basis. Whilst many go for immediate slaughter a percentage are suitable for further finishing. ANM holds regular breeding sheep sales at Thainstone throughout the autumn with ewe lambs, gimmers and cast ewes of all breeds on offer. The first gimmer sale in the second week of September and sees top draws from around the north-east taking to the ring in evenly drawn batches. The principal Mule ewe lamb sale is held a week earlier and attracts regular buyers. Thainstone is essentially a market for top quality low ground breeding stock.